Photo: courtesy of Mary Ellen Burke, Gurranecoyle, grandaughter. Photo: first appeared in Out and About in Killererin, 2005 P. 108. Dunleavys of Barbersfort c. 1920. Photo: courtesy of Rosaleen Molloy, Corofin, daughter. 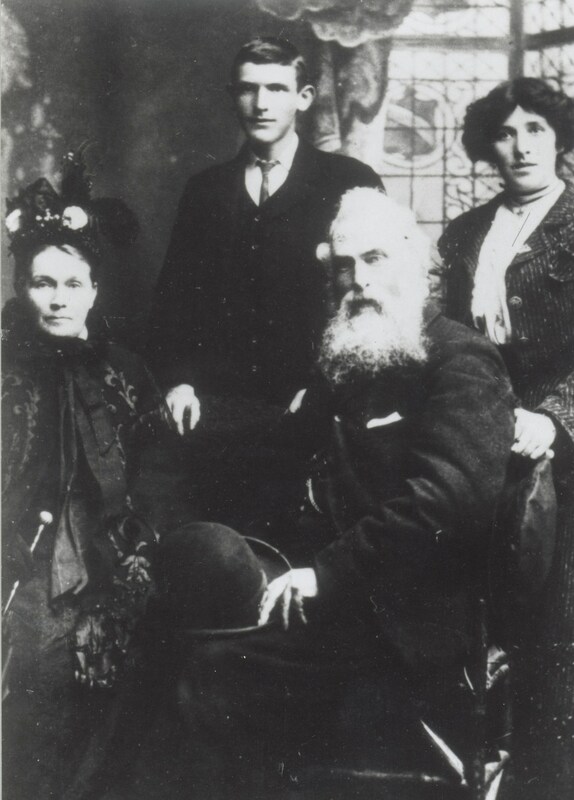 The Burke family, Garra - Front l-r: Sara Burke, nee Connelly adn her husband James. Back l-r: Their son James and daughter Nora. Photo: courtesy of Mary Burke, Garra. 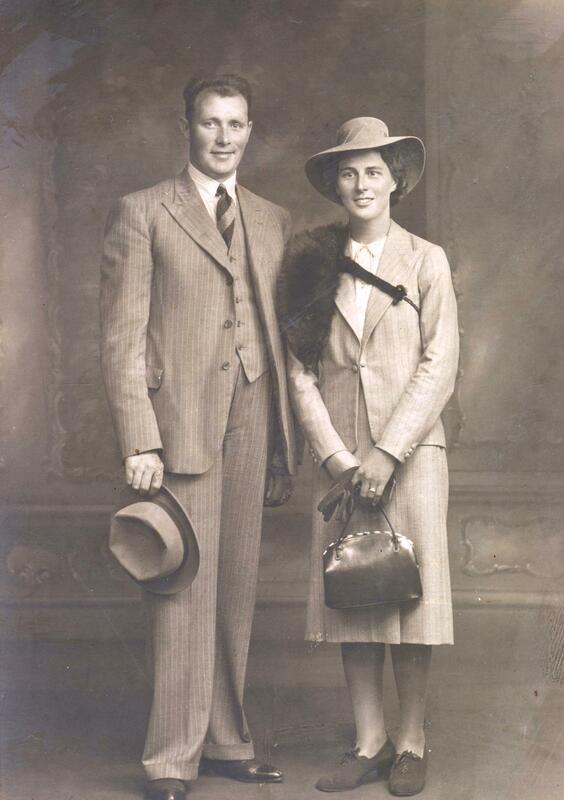 Fashion in Ireland in the early part of the 20th century, like today, was quite varied and fashion in Killererin was no exception. The clothes people wore depended on whether they were working people or landlords and of the upper classes. In Ireland, fashion was not ostentatious, unlike women’s fashion in the USA where brighter colours were more acceptable. 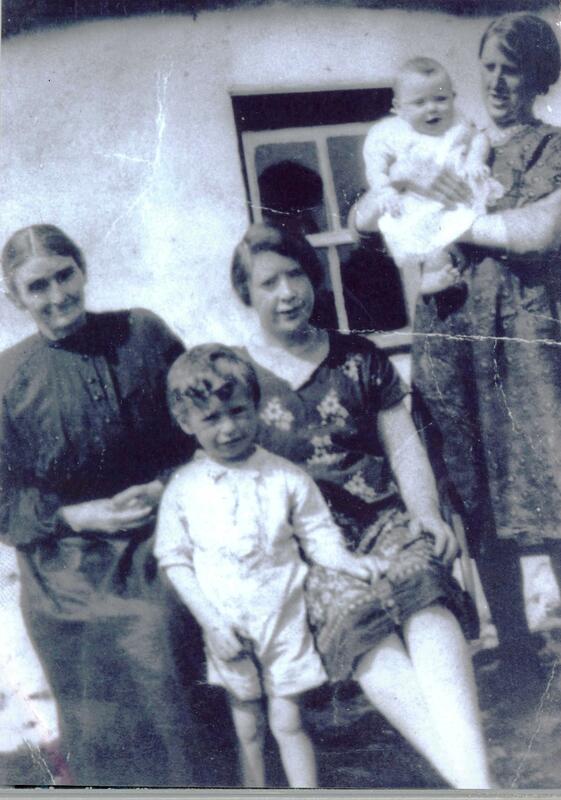 For working women in Ireland, their dresses needed to be durable as they did not have many. They tended to look more like a uniform and had quite an unflattering shape compared to those of the upper classes. Red flannel petticoats and shawls were worn. Footwear usually consisted of clogs. During the day, wealthier women wore what was typically known as a ‘walking-suit’. This consisted of a skirt, blouse and sweater. These outfits were paired with low-heeled sturdy shoes. Popular colours were qutet drab, e.g., navy, grey, black, taupe, beige and olive green. In the 1920s, bright colours were not the ‘norm’. Accessories were often paired with this style of dress, although nothing too extravagant. Usually, a single string of pearls and a hat were worn with this attire. Typical wear for special occasions consisted of a sleeveless dress, high heels, sheer hose, long gloves and a very extravagant hair-do, along with lots of jewellery. Hats were not appropriate for evening wear unless it was a turban; turbans are still popular today and are worn by many celebrities. Sequins, fur, lace and mesh oozed wealth and class during the ‘roaring 20s’, and are still worn by wealthy Irish ladies today, so not much has changed. One big difference between the past and today is that women did not wear trousers back then. Fashion in the present day. Present-day high street fashion tends to mimic more expensive designer brands which makes it particularly difficult to differentiate between designer clothes and imitation brands.This is in stark contrast to the 1920s when the difference was plain for all to see. Men dressed in a three-piece suit consisting of a jacket, a waistcoat and trousers, tailor-made to measure from a fine tweed length of cloth. The suit was worn with a shirt, collar and tie. Shirts then came without a collar. A separate, starched collar was attached to the shirt with special collar studs. The waistcoat pocket was adorned with a gold or silver pocketwatch on a chain. A trilby hat or fancy cap was worn to complement the outfit. Men wore this to mass, funerals, weddings and social occasions. Every man had one other essential piece of clothing – a good overcoat, mostly a ‘crombie’. Farmers and working men, particularly the older men, wore bauneens. The bauneen was a type of off-white flannel cardigan or jacket made of finely woven pure wool. 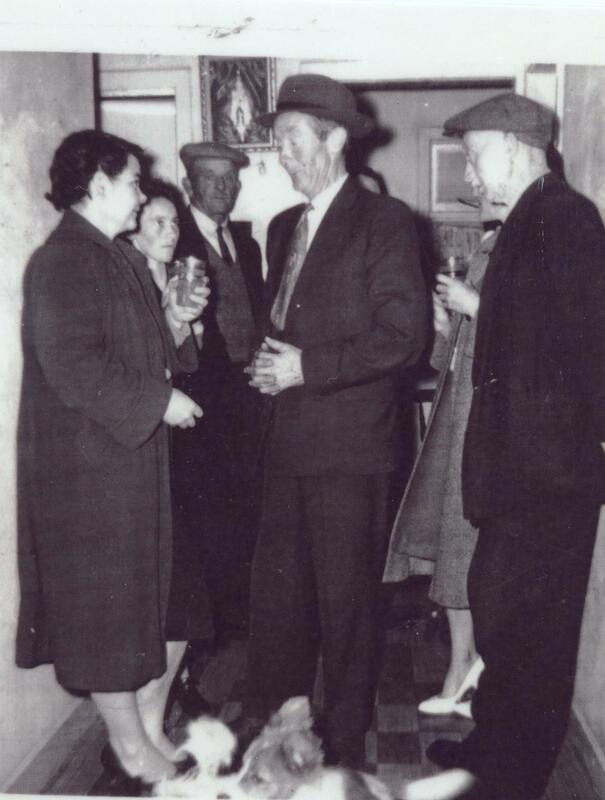 Thomas Duggan, Tygreenane, always wore his bauneen. He continued to wear it until he died on the 10th January 1969. Trousers were made from corduroy and socks were knitted with sheep’s wool saved after the shearing. Footwear was clogs with wooden soles. A lot of houses had a ‘last’ on which shoes or clogs were repaired. Sometimes, clogs were home-made by buying wooden clog soles and taking the uppers from an old shoes and tacking these to the clog soles; this was called ‘clogging’. As mentioned elsewhere in this book, particularly in the interviews with older people, children only wore shoes to school during the winter and boys traditionally wore short pants until they were about 10 or 11 years old. The following are memories recalled by Margaret Monaghan of Castleview. The older women wore long skirts to the ankle and mostly high necks. They wore big heavy coats in winter and some had fur collars on them. In summer, they wore what they called a costume, ¾ length jacket and skirt. A costume was made to measure by a seamstress and worn with a blouse. The costume was worn with a hat, normally of felt for the winter and straw in the summer, and was used for going to mass or shopping. The hats were trimmed with ribbon and, maybe, flowers or feathers – no one went to mass then without a hat or cap of some sort, although some women never wore hats, only shawls; older women had long hair, done up in different styles to suit themselves. They had light boots for Sunday and heavy ones for every day wear. The young girls wore shorter skirts well below the knee and wore shoes instead of boots for Sunday. Women had cotton dresses for summer, which they usually made themselves, and heavy clothes for winter, usually sent from America. There was no make-up, only soap and water. If you had perfume, you were in great style. When working, women always wore an apron, some even wore one made from a canvas bag. Clothes had to be cared for as they were in such short supply. People used to spin wool and knit socks. In later years, people started knitting jumpers and cardigans and buying coloured wool in the shops. Everyone was taught sewing and knitting at school and some were very good and could make anything. There have been several changes of fashion and custom in attending church. Up to the early 1970s it was the norm for every girl and lady present to have her head covered either with a hat or a mantilla (a lace or nylon square). Men always removed their caps or hats on entering a church and for the most part still do so today. The above article was first published in Killererin – A Parish History in 2015. This book is available to purchase on this website or in your local Centra shop, Barnaderg or Books R Us in Tuam. Information from Mary Dunleavy, Barbersfort. Information on Thomas Duggan from his daughter Mary Ellen Burke, Gurranecoyle. 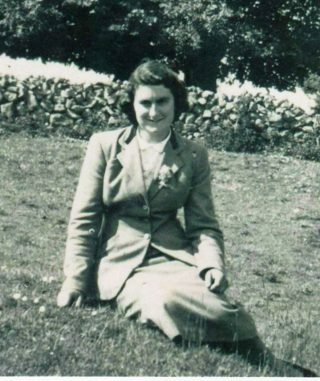 Margaret Monaghan, late of Castleview, Barnaderg. 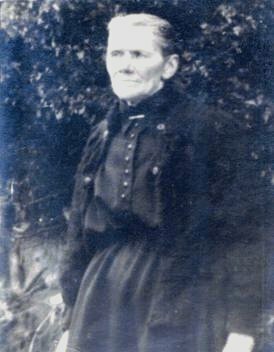 Information from a copybook of memories of Margaret Monaghan, late of Castleview, Barnaderg. This page was added on 14/08/2017.